PROSPECT — The town’s ice skating rink is open for the season at a new location. Officials set up the temporary ice skating rink on the field behind Town Hall on Center Street. It’s open from sunrise until 10 p.m. daily, depending on the weather conditions. A sign posted at the rink will let skaters know when the rink is closed or open. 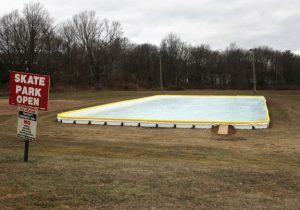 Previously, the town set up an ice skating rink up at Hotchkiss Field on Waterbury Road. The rink was underused and difficult to maintain, and the town purchased a new temporary rink for this winter and set it up at the new location. The rink is for recreational ice skating. No fires, hockey playing, bicycles and skateboards are allowed on the rink.